The K40 RL100 offers the ultimate portable protection, fully customizable for the way you drive. A radar and laser detector you can trust, backed by a company of real people who genuinely care about your driving experience. The K40 RL360i is the only radar and laser protection system in the world that is fully customized for your automobile and the way you drive. When installed with the Laser Defuser g5, you get a 360Âº Force Field of Protection from every kind of police radar and laser used today. From the front, the rear and the sides. Discreet, Custom Installation. Your K40 radar systems are installed by master technicians, ensuring that your system is discreetly and elegantly integrated into your vehicle's cockpit. New LED Brightness Control -- 5 customizable LED brightness settings. Allows you to adjust the intensity of the led's depending on the time of day or your visual preferences. New Remote Control -- Completely redesigned with easier access to the most popular features. It's invisible! You'll only know it's there when you need it -- Unlike any other radar detection system or portable radar detector on the market, the K40 RL360i is invisible. No plugs, no wires, no unsightly box to compromise the elegance of your automobile's interior, or draw the attention of police or vandals. Customized for your automobile -- The make, model, interior, accessory package, and even the color of your vehicle will determine its components, programming and installation. Your authorized K40 Dealer is an expert you can trust, and your K40 Consultant is only a phone call away. Please call 800.323.5608 anytime, day or night. You'll be surprised and delighted by our knowledgable and available experts. No maze of voice prompts. No voicemail. Just real people. Integrated GPS antenna lets you Mark to Mute or Mark to Alert -- The K40 RL360i allows you to build your own data base of locations that are important to you.Mark to Alert for locations such as dangerous intersections, speed traps, school zones and portable speed cameras. Mark to Mute specific radar bands for locations such as automatic door openers, security systems etc. Quiet Ride --The K40 RL360i allows you to set a minimum MPH detection speed that eliminates all audible alerts until the vehicle exceeds that selected speed. 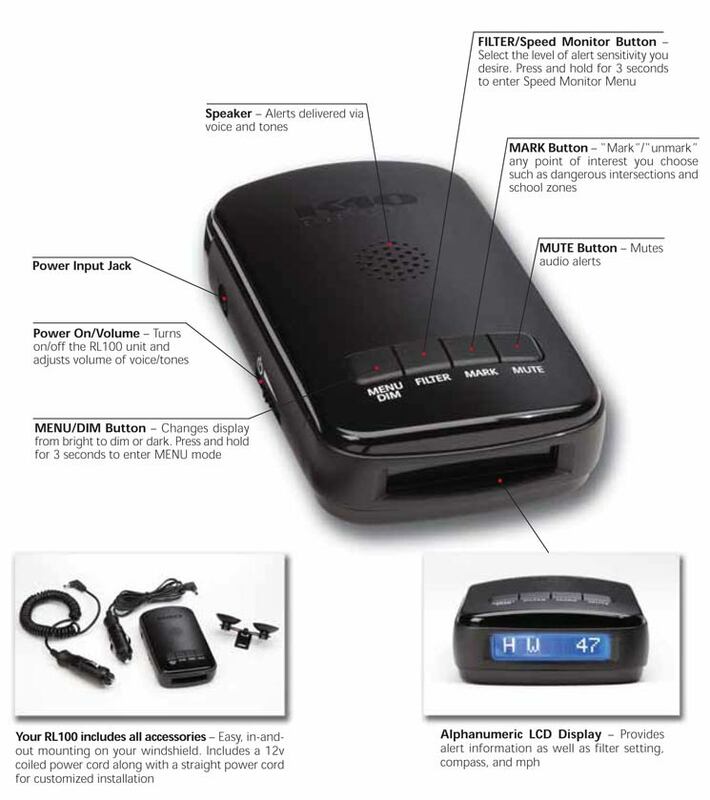 It's ideal for long road trips or when you only want to be alerted if you exceed a set speed limit. Speed Monitor -- This feature gives the driver a constant audible alert whenever a preselected speed is exceeded. The interior LEDs will also illuminate. Great for young or new drivers and accidental lead foot. Self control. Parental control. The New K40 Laser Defuser g5 emits a powerful infrared light signal back to the police laser gun at a pulse rate it cannot understand. This enables the driver to avoid detection and ultimately a speeding ticket. The new Laser Defuser g5 interface module allows up to three additional laser defusing transponders that mount on separate sides of the vehicle, front or rear, for maximum coverage and performance. It's all the protection you'll ever need. Fly Eye Lens. A lens composed of an array of smaller lenses designed to provide increased off axis signal capture. Sync Interface. The sync feature fires up to 4 Defuser g5 transponders simultaneously emitting more jamming output to the laser gun than ever before. 3 User Selectable Transmit Modes. Constant Transmit: The Defuser g5 will continually transmit a jamming signal for the duration of the laser encounter. Pulse Transmit: The Defuser g5 will transmit a jamming signal for 10 seconds giving the driver time to reduce speed, while allowing the officer to obtain a speed reading and eliminate suspicion of "jamming". Receive Only: For notification only, no jamming signal will be emitted. Laser Alert - Provides warning of police laser targeting with a unique audible and visual alert, giving the driver the time needed to react and safely reduce speed. License Plate Mount- Strategically positions Defuser g5 right where police laser gun operators are trained to target, while providing a stealth, OEM appearance for the system. Every K40 device is backed by the 1 Year Ticket Guarantee!